"After an extensive search of the Internet looking at schools all around the world, we decided to begin a correspondence with Pat Nolan to determine if she would be interested in fashioning an intense learning experience of the sort that we were looking for. Pat and I exchanged several e-mails and my wife and I soon became convinced that this was precisely the teacher and the type of learning experience that we were looking for. We were particularly attracted to the idea of having a course in which we lived on a fairly large sailboat for nearly a week so that we could be fully immersed in sailing day in and day out. Pat Nolan's course fully met all of our expectations. In fact, it would not be an exaggeration to say that our expectations were exceeded. 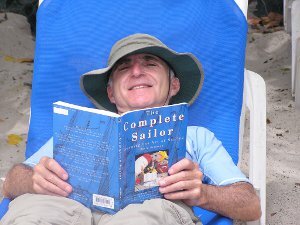 Pat is a very gifted teacher and an exceptional sailor. One of her gifts as a teacher is extraordinary patience. And a second is her ability to break down complex tasks into simple parts and then to reinforce those parts by continual repetition. Pat also makes extensive and effective use of visual aids. In short, Pat Nolan is a gem of an instructor." "Your teaching method is what has kept me dreaming of going cruising since we first me in the 90's"
"I was the scared 'mama' and you fixed all that. I remember getting out of the slip headed the wrong way. I panicked thinking 'Oh my God - we have to turn around and there isn't enough room - and you said quietly, 'It's OK, we'll just go out backwards'. I learned there is more than one way to do everything. It's been my motto ever since." "Your enthusiasm, patience and perseverance (we WILL get that #2 jib up!) is an inspiration"
"This trips ranks as a highlight of my life"
"This has been an extraordinary week - thank you! 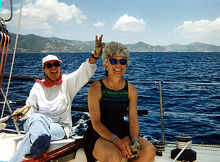 Not just for your patience and teaching re: sailing but also for your lessons in many other categories, especially fun!" "We had an absolute ball, as well as learning quite a lot. You are an excellent teacher and a very cool sailor". "I learned so much I still can't believe it. Your teaching style matched my learning style. You are a very patient and extremely knowledgeable instructor." "My experience in the BVI was beyond my wildest expectations. I began the trip with no idea of what was ahead of me and soon that was replaced with great enthusiasm and a strong determination to experience all the things that were around me, i.e. the water, the culture and most importantly the thrill of sailing. Thank you very much." "It was so awesome! I learned so much (about sailing, about me), and I feel proud of what I did, and mostly, I feel confident now. You are a magnificent teacher; I loved the mix of serious teaching and then the playing. I admire your skills, your ability to handle the boat and us, and your directness. I'm telling everyone they ought to make the trip and do this. " "Thanks for a great week of sailing and racing. You did an excellent job teaching prior to the race and instructing during the three days of racing. You put together a good team; it takes a strong leader to prepare the students and allow them to do critical things like starts. I really admire the decisive, instantaneous, high pressure problem solving and decision making you do." "Pat is an extraordinary sailor and an exceptionally skilled instructor - a rare combination - someone who "can do" and teach it as well!!! We are still marveling over the wonderful experience we had. Pat gives clear, concise instruction mixed with fairness, patience, and a healthy measure of humor! I can honestly say I walked off that pier after a week of sailing under Pat's instruction with a great amount of confidence in my ability in crewing the boat...my time at the helm was a HUGE learning experience and it was incredibly exciting and empowering....I am hooked for life!!"